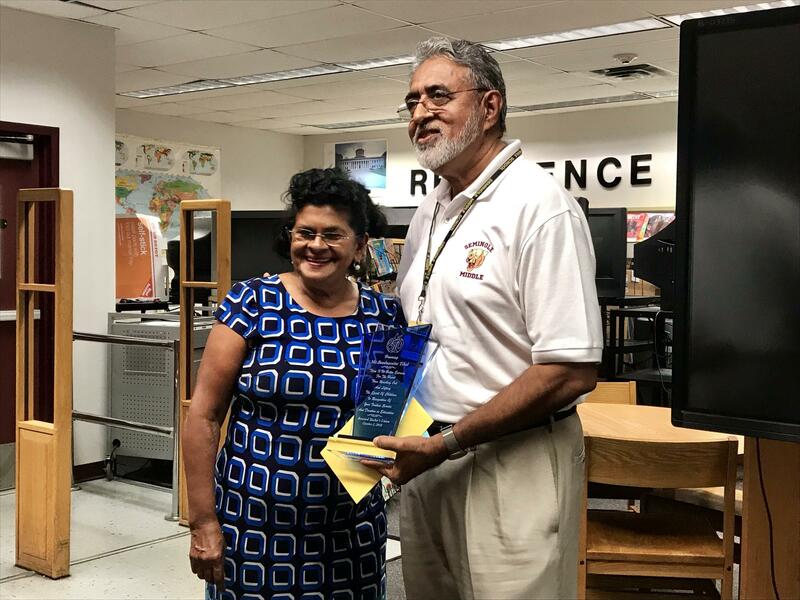 Boodnaraine Tihal, right, poses with his wife after the Broward Teacher's Union honored him with a plaque at Seminole Middle School Tuesday. 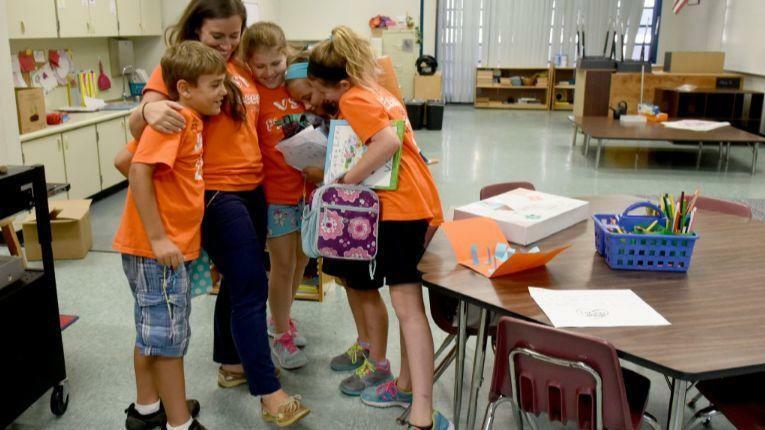 On Tuesday the Broward Teachers' Union threw him a surprise retirement party in the media center at Seminole Middle, where he's taught for 14 years. They presented him with a plaque, lunch and a cake. "He's Mr. Peace and Serenity," said Amy Jacobson. She's been teaching in the same department as Tihal for years. "Professionalism like that can't be replaced." When Jacobson's own daughter was injured and went to middle school in a wheelchair, she would spend mornings in Tihal’s classroom with his other students, who are severely disabled. "Mr. Tihal was able to bring out the best in my daughter," she said. 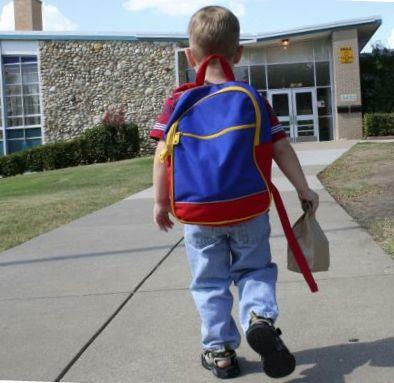 "As a parent, when a teacher is able to boost you…I will never forget that. And I will always appreciate it." 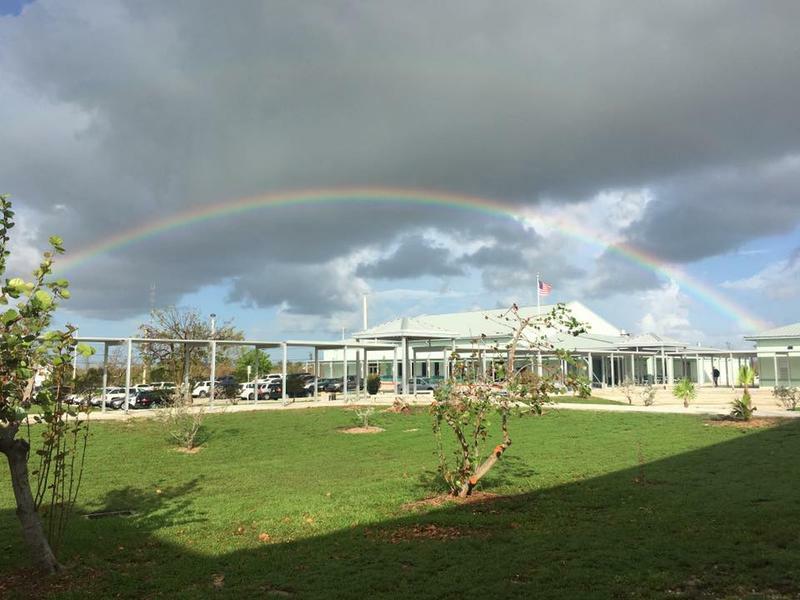 Bernadette Piracci started teaching social studies and geography at Seminole Middle around the same time Tihal did. "You can ask him anything," Piracci said about Tihal. "He has so much to share, he knows so much… You can hand him five different subjects to teach, and he’s on it." When asked how he would change the current educational system, Tidal said he would try to foster a greater sense of civility and responsibility in students. And that starts at home, he said. "We're too much in our corners, and we're too insular," he said. "We need to get out there and understand different people, different cultures." He admits the last year of teaching has not been easy, especially since the Parkland shooting. But he said teachers shouldn’t give up. "This effort that is being made after Parkland, I’m sure it will get better," Tihal said. “Not that everybody likes it, but you know, these are the times we live in so we have to go through all the security checks and take time to do that - because lives are important." Now Tihal is planning to take advantage of his newfound free time. "I'll be at my home fixing my garden, keep it going, and then take off to see my grandkids and do some traveling," he said.